Find the perfect hairstyle for saree and be a desi goddess! The Best Hairstyle For Saree All Women Would Love To Experiment With! Hairstyles can make or break a look, this is no secret! Read on and find the perfect hairstyle for saree to flaunt this shaadi season. Ladies, ‘tis the season of festivities and we all know what that calls for! A stunning makeover! Sarees are tricky, but with the vivid designs and structures available to women today, there’s something for everyone. Pairing it up with the perfect hairstyle for saree is the cherry on top! Let’s get acquainted with some potential hair styles for saree you can adorn to let your inner fashionista take the front seat at weddings, parties, and engagements (or beyond)! Parties come in various kinds. There are cocktails, birthdays, anniversaries, and more to look forward to this time of the year. Your party wear hairstyle game should be on point, along with your outfit and accessories. Soft luscious waves make you look like a million bucks if you plan on going for an open hairstyle for party. One of the best hairstyle for saree short hair women can try on are finger curls. They’re an all time classic, and were made for you to stand out in a crowd! A basic, no fuss saree demands an equally simple hair style for saree and that is why a half pony will do wonders. To add an extra element to this, go for a beautiful maang tika, one that matches your ensemble perfectly. This is the time to make use of all the accessories you thought were out of trend. The list of hairstyle on saree for party is endless but one that stands out the most is the low back chignon. While we’re still on the bun hairstyle for saree, let’s also talk about the perfect bouffant which is going to add 10 times the glamour to your ensemble! Embrace your ‘desi girl’ at the next party you go to, and who knows how the night might end? All Eyes On You! 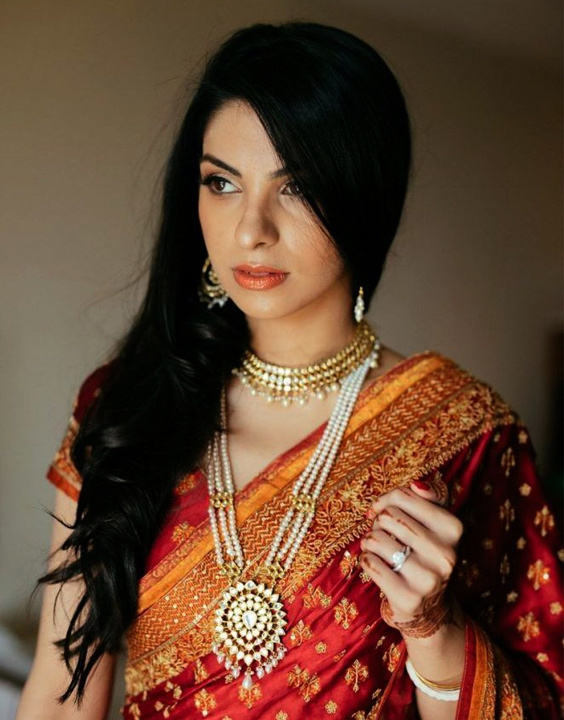 - Love This Hairstyle On Saree For Engagement! Engagements - while not as tedious as weddings - are still a really important affair. Looking and feeling your best should be on the top of your agenda when you’re getting engaged or you’re just a part of someone else’s. Attention to detail is key! Sarees are a popular engagement outfit and it is essential to do your hair depending on the type of saree you’re wearing, and also according to the length of your hair. If you’ve got a long mane, then half up curls are the best curly hairstyle for saree. If a curly low down is not for you then a simple yet elegant half-up puff that goes with every saree could be your choice of hairstyle on saree for engagement. Among the long list of saree hairstyles for medium hair, a gajra bun is one of our favourites! Gajra buns are best with round necklines. The look super-elegant! If traditional hairstyles for saree are not your thing then mix it up with a Chinese top knot. Simple but effective, this hairstyle has gained a lot of fans because of it’s no-fuss nature. Bun hairstyle with saree is a favourite and can be adorned by anyone, regardless of the saree type and hair length. Anyone who has ever been to a wedding can agree that weddings are an absolute roller coaster. They’re chaotic but systematic, happy with some occasional stray tears. The low maintenance, easy to make and easy to accessorise Braids are arguably the best hairstyle for saree. You can get creative with braids and go for one that speaks to you the most. An amalgamation of western and traditional; a side fishtail braid is easily the prettiest hairstyle on saree for long hair. Find someone that caught your eye? Do the famous desi ‘choti flip’ and let your hair do the talking. Join the club of fearless fashionistas and take a chance on the bubble ponytail which goes best on collared necklines and is the most fashion forward hair style with saree. Consisting of simple accented twists and a few pins and rubber bands, this hairstyle will have you looking badass and command everyone’s attention. This not where the hair journey ends for you, there’s a lot more that you can try. Some of the best Indian hairstyles for saree include the puffed-up bun, the side accent french braid, and our top pick – texturized curls with maang tika (that’s a whole mood in itself). These hair styles for saree are an absolute delight to look at and ofcourse wear! What are weddings, if not a chance to show off your styling skills anyway? 7 Traditional Indian Bangles That Are On Every Jewelry Lover's Mind!